While visitors to Boston likely encounter Charlestown when they stop by Old Ironsides at the end of the Freedom Trail, we locals have watched “the town” evolve into one of the city’s hottest neighborhoods in recent years. Sadly, we just entered the last full month of summer, but Charlestown is just kicking into high gear with a few recent additions. Hop aboard the Boston Harbor Cruises (www.bostonharborcruises.com) water taxi from our own World Trade Center terminal, and sail your way to a fun afternoon. The Castle Island Beer Garden (1 Constitution Wharf, Charlestown) starts on Sunday, August 5, and boasts brews with a view. The local craft brewer was originally slated to open a beer garden in the South End but changed course for Charlestown over the summer. The space is right on the Charlestown stretch of the Harborwalk and features some of the best views of downtown Boston, so come prepared to Instagram (and sip). Once you’ve reached peak IPA intake (as if there is such a thing), wander into Charlestown for some necessary historical sights. 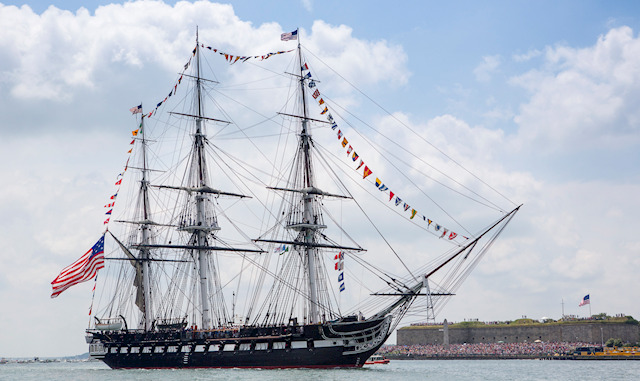 Closest to the beer garden is the USS Constitution Museum (Building 22, Charlestown Navy Yard, Charlestown), where you can visit the world’s oldest commissioned naval vessel still afloat and learn how it buoyed America through the War of 1812. For those looking for a longer stroll, the Bunker Hill Monument (Monument Square, Charlestown) is the historical marker for the Battle of Bunker Hill, fought across Charlestown during the American Revolution. These days, it sees more dog walking than warfare.